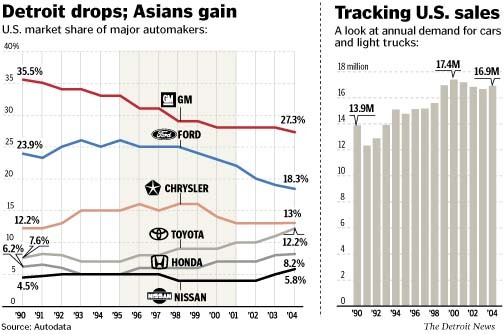 Having a commanding 76% market share (GM 43.8%, Ford 20.4%, Chrysler ~12%) in the United States in 1980, the Big Three Automakers now only carry a 47% share of the domestic cars and light trucks market in 2008. With a complete hold on the domestic market, what happened? The answer lies in how the perception of domestic brands versus international brands have completely swapped. The reason has been the inability of GM, Ford, and Chrysler to predict the intermediate-term trends of the consumer market. Whether this was due to hubris, denial or plain ignorance is debatable, and most likely a combination of all three. Japanese cars in the 1970s through the end of the 1980s had the perception that they were horribly unreliable and problematic. European cars had a slightly better, but still negative perception. Instead of realizing that underdogs, or those working from behind, tend to be more hungry and nimble, the Big Three sat on their behinds and continued to pump out staid and non-innovative cars. When the perception of Japanese cars started making headway in safety and comfort in the 1990s, such as the Accord, Camry and Lexus brand, the Big Three was still slow to respond. When the European automakers started importing cars known for luxury, style, speed and beautiful interiors, the Big Three was slow to respond. Even for American icons such as the Chevrolet Corvette, the constant criticism had always focused on how ugly and boring it’s dashboard was. It wasn’t until the latest version, the C6 generation debuted in 2005 (and to a lesser degree the C5 in 1997) did people start complimenting it’s interior. Why did it take so long? What about the Ford Taurus, which was the highest selling car in the mid-1990s? Instead of maintaining it’s sales lead with innovation and style, Ford had to scrap that model in 2006 (only to be resurrected in 2008 by re-labeling the Five-Hundred as the Taurus). When they fell behind in the 1990s, the perception of American cars became that which its competitors were known for a decade or two ago, boring, unreliable, and unsafe. The last twenty-five years, we have witnessed the Big Three automakers miss or been slow to recognize the consumer trends toward reliable, safe, comfortable, fuel efficient and greener vehicles. The decline of its market share is clearly a result of this. However, it is also important to note that another big reason for its inability to be nimble in recognizing trends is due to its ancient corporate culture and the strength of the autoworkers union. Had the union and the companies worked together by compromising, we might not be seeing such drastic layoffs and cuts the past ten years. The near-sightedness continues to this day. In an article today on MSNBC.com – GM to close 4 factories, may drop Hummer, CEO Rick Wagoner makes another strong statement in reference to the decline of large vehicle sales, “We at GM don’t think this is a spike or a temporary shift.” He believes that the change in the U.S. market to smaller vehicles is likely permanent. As already behind the curve in a consumer move towards more fuel-efficient cars, by jumping on board now with blanket statements like that seem near-sighted. Although current trends support the notion that fuel-efficiency is equivalent to size of vehicle, this might not be the case in the long term. Current vehicles support that correlation only because the weight of the vehicles require larger engines and thus more gasoline per mile driven. However, this is purely an energy source problem and not a size of vehicle problem. Americans are not moving to smaller vehicles because they want smaller cargo space, weaker torque and lower high-end speed, they are moving to smaller vehicles out of necessity. High oil prices and sympathy to global warming have forced them to evaluate the price and efficiency of the cars they drive. If large vehicles, like the SUV, were to be powered by a renewable alternative energy that is just as powerful and efficient as gasoline, just as affordable as current vehicles, and much cleaner for the environment, Americans would be more than willing to buy them, probably at a higher pace the late 1990s. Imagine a brand new 2009 GMC Yukon that achieves the equivalent of 50 miles per gallon, produces no waste, and costs $40,000. GMC would have a hard time keeping up with demand. Although not possible today, it is possible in the next 10 to 20 years. Look how much vehicles have changed since the 1970s. Seatbelts, airbags, electronic-stability control, cleaner fuel, and hybrids are just to name a few. Why make a statement that large vehicles are gone for good? It sounds good now, but it’s purely another example that GM fails to recognize that the problem today is fuel efficiency, which might not correlate to size of vehicle in the future. The highway system of America is built for large vehicles, not small vehicles such as the Mini Cooper or Smart ForTwo. Even in the cities, small vehicles are not necessarily safer. Our highways and suburbs were built with the notion that gasoline would be permanently accessible and affordable. As the world moves to renewable energy resources as oil hits peak production, it is in the best economic interests of America to continue researching safe and efficient vehicles for our highway system, instead of the other way around. Thus, GM is near-sightedness in completely scrapping the idea of big vehicles. They should be researching the possibility of renewable energy efficiency in big vehicles in parallel to short-term trends of small cars having higher fuel-efficiency. “Sen. Chris Dodd (D-CT), chairman of the Senate Banking, Housing, and Urban Affairs Committee, dressed down auto industry executives at a hearing Tuesday, calling them short sighted and unimaginative, as the industry seeks $25 billion of taxpayer money to ward off looming bankruptcy.